Two wonderful lives associated in a magnificent ceremony, one of the most superb enacted by the Sov­ereign Pontiff in the most splendid of temples, St. Peter's in Rome. At first glance they would seem to be contrasting entities; and yet they stand well together, as they do in the great banner that hangs over the portal of the basilica. But cer­tain special characteristics the two Saints have in common: both vir­ginal souls drawn singularly and potently from their first years to the one love of their Celestial Spouse; both ardent lovers of the Cross, of the most Blessed Eucharist, and of the "dear Mother" Mary; both over­whelmingly eager for the salvation of souls for which Christ died. But while the Holy Spirit moves Mother Pelletier, religious and Foundress, toward wide horizons, toward missionary work and foundations afar, and gives her for her portion innumerable daughters. 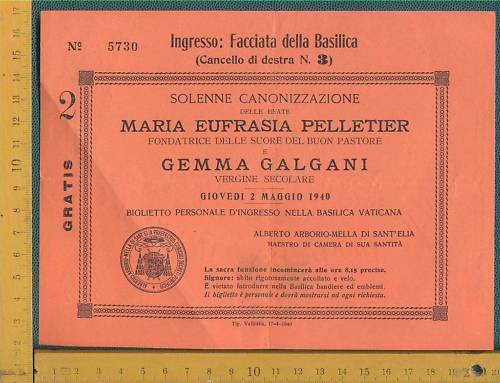 ­Gemma, a little girl in modest surroundings, in an old-world provincial city of Italy, is called by the Beloved to a hidden life of extraordinary intimacy with Him. Vividly realizing what He suffered to buy back a fallen race, she offers herself spontaneously to share His sufferings, en­treating Him to divide them with her. And He hears her prayer. The day will corne when He will reward her lavishly, but in the meanwhile she will share His painsl Wounds that shed living blood, the Scourging, the Crown of Thorns, the Agony upon the Cross. Her Passionist biogra­pher has said justly that God has thrown this mod­ern-day child in the teeth of a materialistic and un­believing generation to show that His ann is not shortened and that He will have Saints who are' pure mystics, now, as He did in the ancient ages of Faith. The French Foundress of the great Order of the Good Shepherd, and the little Tuscan girl stand together today upon the banner that hangs over the entrance to the world's Ca­thedral. 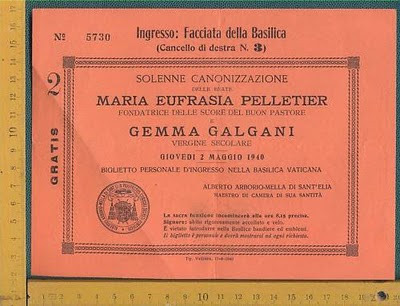 The ceremony of Canonization is one of the most solemn ever per­formed and the crowds pouring into the basilica from the first opening of the doors testified to the eager­ness of the faithful to be present. The interior of St. Peter's offered a magnificent sight. Hangings of crim­son and gold, Flemish tapestries only exhibited on rare occasions, and illumination more brilliant than day­light in the forms of thousands upon thousands of electric candles grouped in crystal chandeliers. The statue of St. Peter wears the tiara, the jewelled ring and the crimson cope of state; the pontifical altar gleams with gold and lights. Two thrones have been prepared for the Sovereign Pontiff; one at the head of the apse, under the window of the Holy Ghost and the Chair of Peter-elevated considerably so that all may see him; and a smaller one nearer the altar where he will vest for Mass. The tribunes are full, and looking toward the nave and aisles, the crowd there is so great that one gets the impression of a sea of faces. Nearest the throne, and to the right of it is the section reserved for the Pope's relatives. Next to that the Tribune of the Postulation, all those who have worked in the interest of the two Causes. 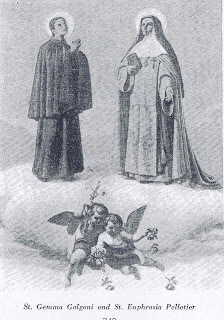 It is a joy to note the many Passionist Fathers standing shoulder to shoulder, to be congratulated today for the noble work they have done, for the little Saint of the Passion is surely theirs; and the groups of the Good Shep­herd Sisters, all white in their immaculate habits and mantles, many Ameri­can Superiors among them. Opposite these the tribune for the diplomatic corps in uniforms, gold-embroid­ered coats and decorations. The seats reserved for the Cardinals and Bishops run in parallel lines at right angles wi th the high throne. Pius XII is exceedingly punctual. The procession was to leave the Sistine Chapel at eight o'clock, Long before it came into sight, repeated storms of clapping reached our ears. From the first day of his accession, the Pontiff sig­nified his desire that there should be no shouting or cheering in St. Peter's. The majority abstain from these demon­strations, but he has not been able to stop the hand-clapping and the waving of handkerchiefs with which his children manifest their joy at seeing him. A few cries of: "Viva il Papa!" still break forth irrepressibly, but the clapping of hands by thou­sands of enthusiastic persons grows to a volume of storm. Presently the silver bugles in the gallery sent the opening bars of the pontifical hymn floating ethereally down the nave. By that signal we knew that the Pontiff had crossed the threshold of the basilica. The clapping grew to the sound of a roaring wind. Then came a silence. 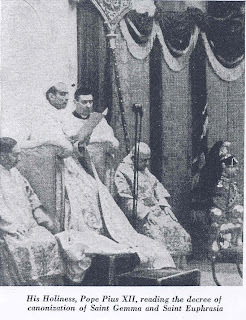 Pius XII was alighting from the Sedia Gestatoria to kneel in adora­tion as he passed the Chapel of the Blessed Sacrament. The hush lasted several minutes, then all the sounds resumed: the chanting of the Can­tors as they advanced, the slow, religious hymning of the silver trum­pets, and that insistent clapping into which voices of boys occasionally flung their irrepressible cheers of welcome. of Rome, the Canons of the various basilicas, and the members of the Congregation of Rites. At this point the banners repre­senting the two new Saints are car­ried, accompanied by notables or living members of their family. The Foundress of the Good Shepherd is kneeling with an ecstatic face lifted to a vision of the Hands of God out­stretched to receive her. All the works she left behind her arc repre­sented by kneeling figures: Sisters of the Good Shepherd, Magdalens, penitents, Preservation class, orphans, Consecrate helpers, native Sisters of St. Ann in India, Xaverian native teacher Sisters in Ceylon, colored and Chinese children. St. Gemma kneels, upon her banner, with eyes and clasped hands raised toward a vision of Our Saviour upon the Cross. The crowd gazes with deep interest and not without emotion upon these significant images. The Cantors come next, and after these various members of the papal household, the Chaplains and Mace­Bearers, the Consistorial Advocates, and others. The Chaplains carry the mitre and the tiara which His Holi­ness will wear during the ceremony. Incense and the papal Cross precede the latter part of the procession. It is composed of high dignitaries of the Church, all wearing copes of white and gold; of the delegates of the seven ancient "Diaconie" of the primitive Church in Rome acting as acolytes. Each one bears a tall wax candle in a candlestick-those seven lights, carried solemnly to the foot of the throne. Afterward they are to be seen moving continually around the altar while the Pontiff celebrates Holy Mass. Before the "Penitentiaries" of the Vatican Basilica two clerics in sur­plices carry the long rods that signify their office, but the rods are bound about with flowers. Finally, rank upon . rank, come the Abbots, Bishops, Archbishops, and Car­dinals, in rich copes of white and gold and white mitres-those of the Cardinals shot with silver; the Prince Assistant at the Throne, Prince Orsini, whose hereditary privilege entitles him to stand always at the Pontiff's right; the Cardinals who are to assist His Holiness, and at length, beneath the canopy, with the "flabelli" of white feathers borne to the right and left of him, the Holy Father, seated upon his chair of state. He wears a richly embroidered cope of white over the long robe of white silk, the falda which at­tendants must lift for him as he walks, and the tiara studded with jewels. An immense clapping of hands greets him at every step of' the way, and people kneel-if they can-or bless themselves in response to the slow movement of his hand. Close around him is the watch of soldiers who are proud to be his defenders; the officers of the Noble Guard, all Roman patricians;. the officers of the Swiss Guard, the of­ficers of the Palatine Guard, and two rows of Swiss Guards in steel helmets and cuirasses. A group of palace attendants and dignitaries follows the Pontiff, and the cortege is closed by a second body of Cantors and the Generals of a large number of religious Orders. The face of Pius XII looks grave as he gazes in front of him. The first year of his pontificate has been full of sorrow and care, yet the spirit in him has a flame-like quality that burns in his eyes. down. He prays with the greatest recollection, bareheaded except for the little white skullcap. Then he rises, and in the midst of the Car­dinals who are assisting him and his attendants, walks to the throne. The proceedings for the Canon­ization proper are initiated. The Cardinal Procurator goes before the throne, between a Master of Cere­monies and a Consistorial Advocate who first genuflects and then reads aloud the formula of request in Latin: "Most Holy Father, the Very Reverend Lord Cardinal Charles Salotti, here present, urgently begs Your Holiness to inscribe in the catalogue of the Saints of Our Lord Jesus Christ and to declare that all the faithful of Christ shall venerate as Saints, Blessed Mary of St. Euphrasia Pelletier, and Gemma Galgani." The papal Secretary for Briefs, standing near the throne, replies that the Holy Father knows the vir­tues of these Beatae and the miracles wrought by their intercession, but he exhorts all present to pray. The speakers then retire to their places, the Pope comes down to kneel at the fald-stool, and the Can­tors intone the Litany of the Saints. Then the Consistorial Advocate ap­proaches the throne again and re­peats the petition, adding to the wOfcl. "urgently" the augmentative "very urgently." He receives the same answer as he did the first time. This time the Miserere, the psalm of penance, is chanted and His Holi­ness remains upon his knees in prayer until the Cardinal Deacon says to him: "Leoate:" It is the signal for all present to do the same. Then the Assistant Bishops come to the Pontiff and he himself intones: "VeniCreator Spiritus." Now, for the third time, the Cardinal Procurator, between the Master of Ceremonies and the Ad­vocate, stands before the throne, and the advocate formulates his request, adding "most urgently." A sort of hush falls upon the as­sembled thousands, as though all felt the solemnity and awesomeness of the moment. The triple crown is placed upon the head of the Sovereign Pontiff. As he stands the people rise with him. "In honor of the holy indivisible Trinity, for the exaltation of the Catholic Faith and the increase of the Christian religion, by the au­thority of Our Lord Jesus Christ, of the Blessed Apostles Peter and Paul, and Ours, after mature deliberation, and after imploring the divine as­sistance and taking counsel with our brethren the Venerable Cardinals of Holy Roman Church, the Patriarchs, Archbishops and Bishops present in the city, we declare that the Blessed Mary of St. Euphrasia Pelletier and Gemma Galgani, Virgins, are Saints and inscribe . them in the catalogue of Saints, establishing that their memory is to be kept every year by the Universal Church in pious re­membrance, on the day of their death," (the Latin says, as the prim­itive Church did; for her martyrs, "die natali;” the day of their birth unto everlasting life). "In the name of the Father and of the Son and of the! Holy Ghost. Amen." Then the Cardinal Procurator as­cends the steps to kiss the hand and knee of the Pontiff, in sign of thanksgiving and joy. The Advocate turns to the Apostolic Protonotaries, and addresses them. Now the Holy Father stands, his mitre is removed, and his clear voice intones: "Te Deum laudamus." The Cantors take it up and innumerable voices rise together in the swelling response. At the end of the hymn of praise the Cardinal Deacon chants: "Orate pro nobis, Sanctae Maria Pelletier et Gemma Galgani," and the Sovereign Pontiff offers the liturgical prayer in honor of the new Saints. The Pontiff is escorted to the smaller throne, nearer the altar, and here he is vested by numerous at­tendants. It is a joy to see with what swiftness he moves, and the elasticity and spring of the tall, slender figure as he bends, turns, rises or sits in the lengthy process of robing. At the Canonization Mass wax candles richly decorated are offered to him; loaves of bread gilded or silvered; small barrels containing wine or water, the first gilded, the second silvered; and finally two silver cages in the form of temples, one containing a pair of turtle doves, the other a pair of pigeons, and a third gilded cage full of song-birds. The song-birds signify the joy of souls in the celestial bliss, an early symbol repeated frequently in the catacombs. As the gifts were borne away, the birds broke into song. The grave face of Pius XII relaxed into a smile, while around him many laughed outright for a moment at the impromptu serenade. Most solemn and touching was the mo­ment of the Elevation when, just over the altar, the music of the silver trumpets floated down from the cupola gallery. Communion was brought to him at the proper time, and he then returned to the altar to finish Mass. What a treasure to be able to read this account! Thank you for your comments. I am glad to hear that you enjoyed this article.